FL27000. 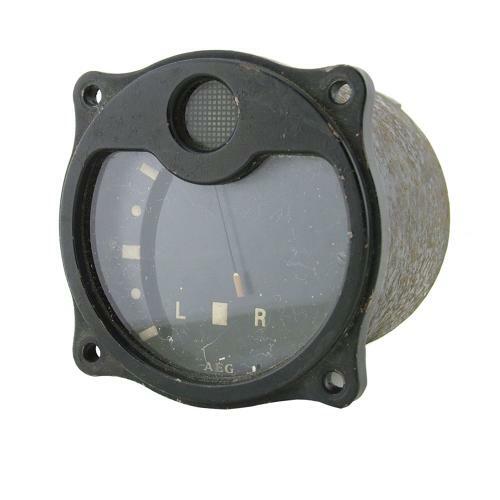 Luftwaffe cockpit radio navigation direction indicator as used in the infamous Ju87 Stuka. Manufactured by AEG, Berlin. Serial number 26301-39 (1939). Black metal case approximately 8cm diameter x 9.5cm depth. Black dial with 'L' & 'R' (links & rechts / left & right) and up/down (for Stuka dive bombing) marked with luminous paint. Indicator needles also luminous tipped. Case shows wear and surface corrosion. Needles move freely. Marked with reference numbers. Good used. Ideally sold to the UK only due to laws relating to radium paint. Stock code M23320.